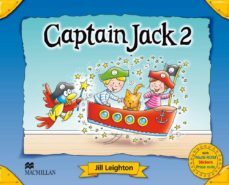 Captain Jack is a flexible, three-level, story-based course suitable for every teaching situation. Based on the adventures of the fun-loving parrot Captain Jack, it aims to help pupils become confident learners of English as they join Jack and friends on their discovery of the world around them. ?My World? lessons focus on crosscurricular areas and include real photos in the Pupil?s Book and Flashcards. Captain Jack also works on basic competences in areas such as maths, art and ICT.